I always thought rice was grown in far off, foreign places overseas somewhere. 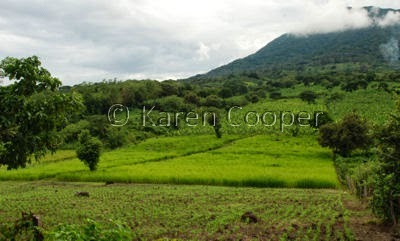 Central America is home to vast rice producing areas. I know very little about rice, except it tastes pretty good with a lot of butter on it. It's used in almost every country in the world as a food staple. I'm sure everyone has a favorite rice recipe that comes to mind when you see the word. Rice is pretty versatile. There are several different varieties, as well as lots of interesting things made from it. Everything from oil and wine, to ethanol. The hard outer shell of rice is called bran. I even found a variety of rice called "Forbidden Rice" that is dark purple when cooked. And "Nakazuke" are vegetables fermented in rice bran. I have just as much fun researching all this information as I do taking the photos! Mmmm...rice and soy sauce is my favorite! Keep up the good work.